Sculpture as a form of art dates back 25,000 years and among the first figures created by man was the Willendorf Venus discovered in Austria. Ceramics on the other hand probably evolved around 24,000 B.C. when humans first mixed clay with water and shaped it into different animal and human figurines. Later, they baked them in kilns partly embedded into the ground. Since then, people of various cultures have developed their own techniques of depicting the world they saw around them through the medium of sculpture and ceramics. The King Art Studio at Henderson introduces you to this ancient form of self-expression through the art classes you can take with us. 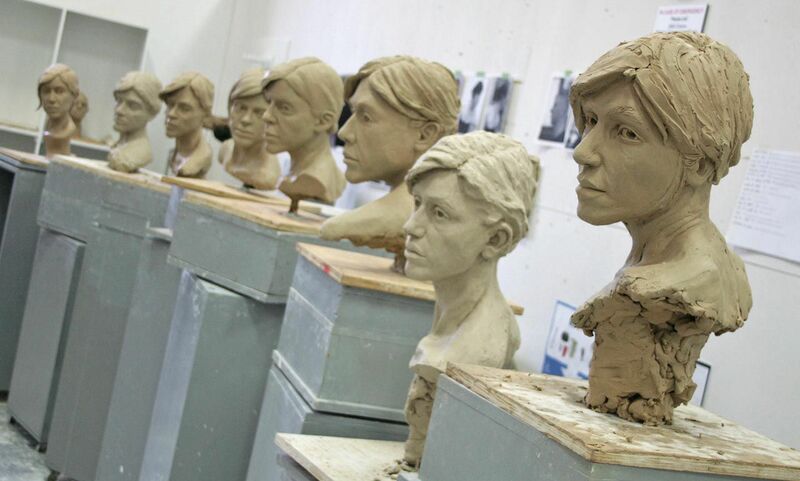 Adults and children can learn to create busts and three dimensional figures by carving them into clay. The technique of transforming a shapeless lump of earth into a recognizable face is an amazing form of art, one that provides immense satisfaction to its creator. Clay is highly versatile and lends itself to the creative efforts of both expert sculptors and also, novices. Feel the texture and pliability of clay as you mold it, shape it and carve images and features into it. Step back and view with pride the face that gazes back at you. Working with ceramics using the coiling technique is another form of art you can learn with us. All over the world, this form has been used for centuries. You will learn how to shape the clay into slim cylinders, like the thickness of a pencil. These cylinders are then rolled up and then placed one on top of the other to create pots. By stacking rolls of different sizes, you can shape the curvature of the pot. With the King Art Studio Art Classes, you will also learn to create vases, cups and plates. A typical ceramics course should take you about 4 lessons. And these art lessons will include the time needed for drying your sculpture, and painting and decorating your creation. Our expert instructors will be there beside you every step of the way showing you how to use the various tools for sculpting and ceramics. We also have King Art Studio sculpture and ceramics classes arranged at after-school hours so kids can participate in them. We hold them from Monday through Friday between 2:30 and 6:30 pm so kids can have fun exploring their creative sides while making lots of new friends. Do enquire about our special packages at King Art Studio and we request that you check in with us in advance since we have only limited space.